Below is an interactive map of our trip, tracked using my Trimble Outdoors Navigator iPhone app. Feel free to browse and refer to the map for details about where we traveled, the photos were taken, etc. You can zoom in, or click the link below for a bigger, fullscreen map. 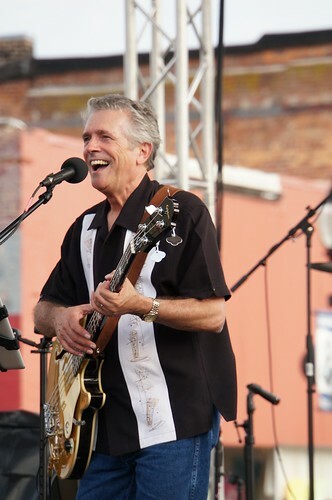 Today’s the big day – we’re finally hitting the road for the 2013 International Route 66 festival, to be held this year in Joplin, Missouri. 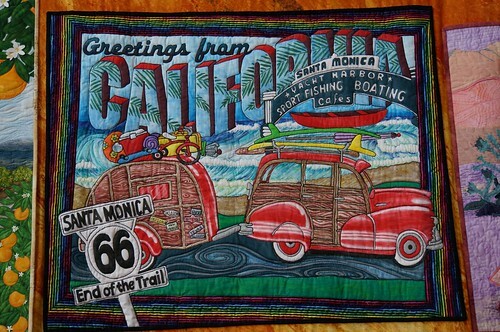 While I highly believe the Route 66 festivals should be held alternating in all of the various Route 66 states, for us and work schedules it’s obviously easier for us to attend the farther east they’re held. 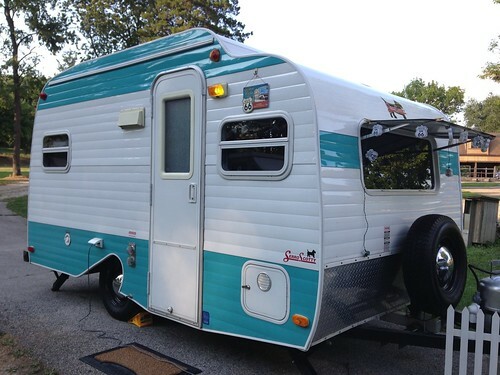 It’s also the first time we’ll be taking our retro/Route 66-themed Serro Scotty trailer on a longer journey – traveling, rather than weekend camping. 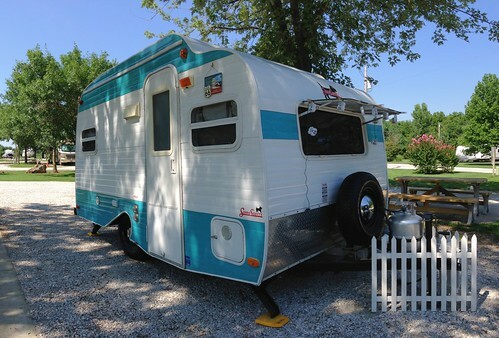 We mostly use it for camping only trips, where we spend the bulk of our time actually hanging out at the campground; to me, that’s a far different experience than using it on a road trip, where it’s just a place to lay our heads down for the night. Though our goal was to stay off the Interstate as much as possible, we headed west out of Indianapolis on the Interstate through Indiana and part of Illinois. In St. Elmo, Illinois, we exited the Interstate and took US 40. An unexpected VERY early morning (after a late night) ensured my need for a nap, so Pat hopped back on the Interstate, which we took through the remainder of Illinois and into Missouri. 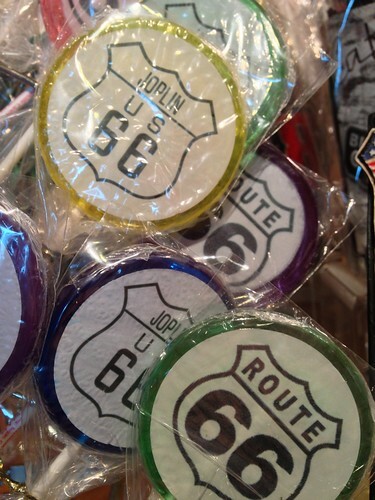 After passing St. Louis, we exited – finally – for Route 66 in Eureka. 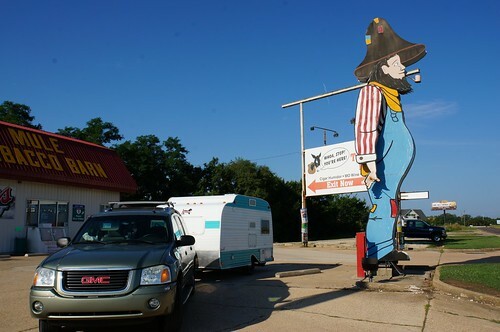 We made our way along Route 66 in Missouri toward Joplin, and our destination for the night would be the Ladybug RV Park, west of Cuba. 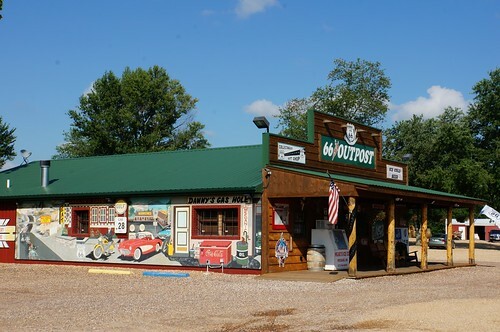 Just before arriving, we stopped at the Fanning 66 Outpost, a great stop along the road for Route 66 souvenirs, a Route 66 soda, some Missouri wine – and of photo op at the World’s Largest Rocking Chair! We went back into Cuba for dinner at Missouri Hick BBQ, then went to a local frozen yogurt / ice cream shop called Dessert Island for some froyo -I got their salted caramel pretzel, which was really good! We were very impressed! We drove around and took a few photos of some of the murals in town (see the slide show at the bottom of this post), that provide Cuba with its nickname, the Mural City; then back to the campground for some much-needed rest. 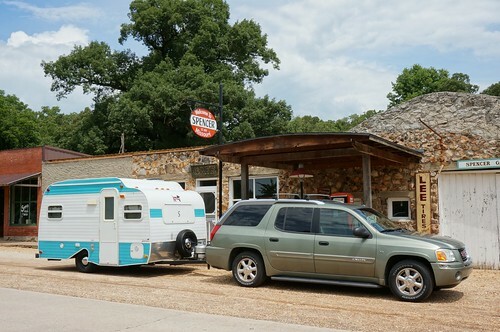 We continued to cruise Route 66, and stopped for a photo op at the Mule Trading Post (it was not yet open for the day). We stopped at the Totem Pole Trading post, where we picked up a “Cars” bag, featuring Lightning McQueen and Mater, for our grandson. Along the way, I noticed a car along the side of the road, and the people by it were waving at us. I waved back, and in the split second we passed by, I thought I recognized them as our Route 66 friends, Kip and Quinn, and their daughter Natalie. Pat wasn’t sure, as he didn’t really notice (being the driver), so up ahead we found a safe spot to pull over and sure enough, they came rolling up behind us! We had a nice roadside chat, then continued on to Joplin. 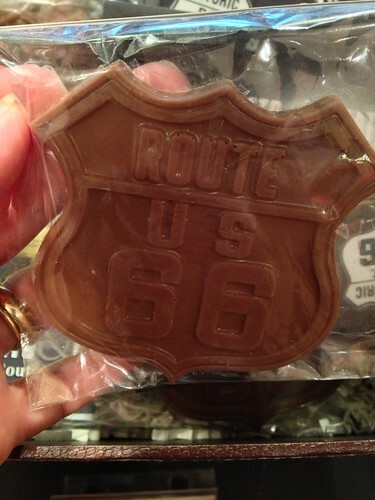 We stopped by to say hello to Ramona, the owner of the iconic Route 66 motel, the Munger Moss, and made our always necessary stop at Redmon’s Candy Factory for a few sweet snacks. 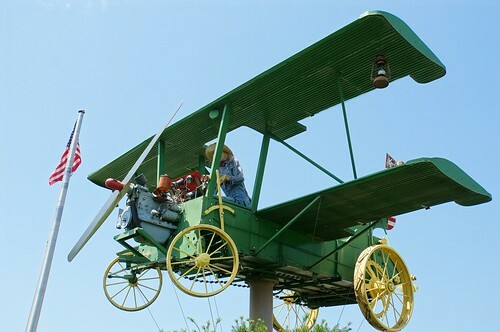 In Carthage, an alert came up on our Garmin GPS’ “Roadside America” app for a roadside attraction called “Crapduster.” The creation of artist/sculptor Lowell Davis, it is a manure spreader fashioned with biplane wings and situated by a gas station. We arrived at the campground where we’d be staying until Saturday, the Big Red Barn RV Park, and got the Scotty all set up. 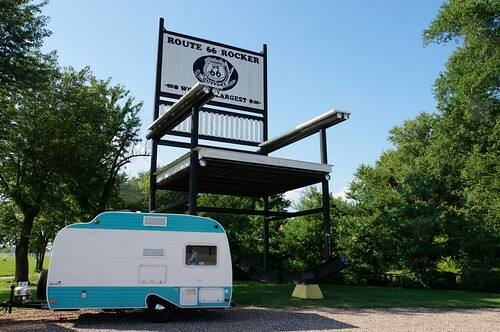 We decided to cruise Route 66 a little more, to head out to Galena and Riverton before we went over to the 66 Drive-in in Carthage. 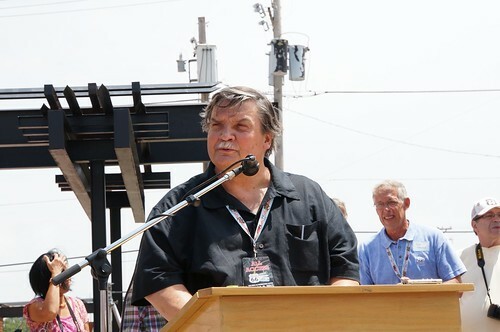 As part of the festival, the 2006 Pixar film “Cars” would be playing at the drive-in and Route 66 author and historian Michael Wallis would be there “deputizing” kids (in addition to being Pixar’s go-to expert on Route 66, he provided the voice of the Sheriff in the film). 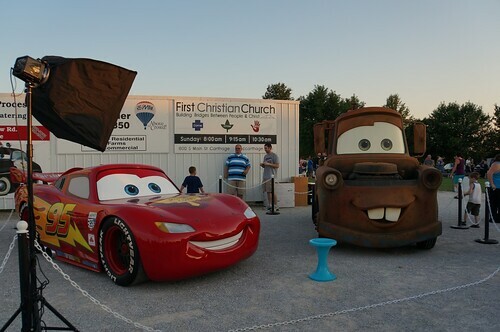 For the weekend, Pixar provided life size versions of Lightning McQueen & Mater, who would be making several appearances throughout the festival. Tonight was their first appearance, at the drive-in. 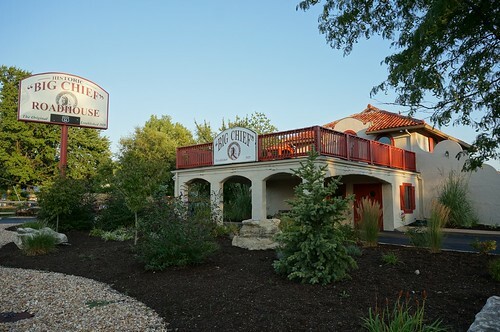 So, we got to Galena, where we saw that the business Cars on the Route, was open and serving dinner. We were hungry, and always wanted to support local business as much as we can, decided to have dinner here. 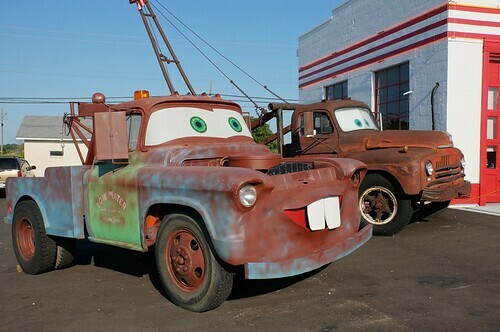 Cars on the Route is the home of the original tow truck that was the inspiration for Pixar’s character “Tow Mater” from Cars (the one on the right). After dinner, we decided we needed to get back to Carthage for the drive-in. We were not doing the cruise, just going straight to the drive-in on our own. We didn’t have too long of a wait, as we showed up later. We were able to get a spot in the back (didn’t really matter to us! ), and started walking around. We ran into a few more Route 66 friends, Mark, Mike and Sharon. We walked up to see the activity at the front, and caught sight of two familiar characters. We even did Face Time with our grandson so he could see the giant Mater and Lightning McQueen – I think he enjoyed it (couldn’t hear a thing as there was very loud oldies music blasting from nearby speakers). It was fun watching Cars at the drive-in, despite having seen it many (MANY!) times before. We were fans when it came out in 2006, after having waited at least 5 years. I first heard of the movie when I saw Michael Wallis speak at a book signing in Chicago in 2001, and he talked about his tour of Route 66 with the folks from Pixar. 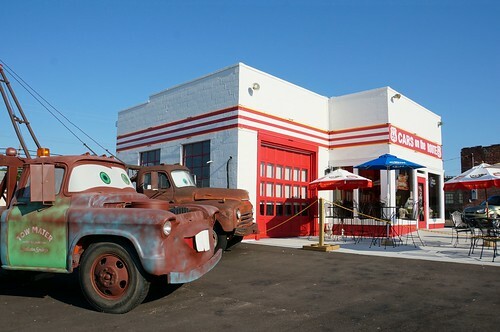 Along with other Route 66 roadies, I was immediately excited about it, having been a Pixar fan starting with Toy Story in 1995, which I took my daughter to see, and following through with many of the others. Now, we’re getting our 2-1/2 year old grandson into “Cars,” so it’s viewed quite frequently at our house! The drive-in is digital, so the quality of the movie is completely on par with its small screen counterpart. Nice! We woke up bright and early to get a start on the day. I wasn’t hungry, but definitely needed some coffee, stat! 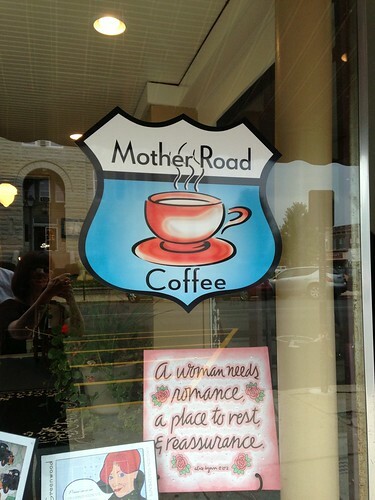 I also wanted to visit a local place, and the Mother Road Coffee, on the town square in Carthage, fit the bill perfectly! Pat got a blended coffee drink and I got a regular brewed coffee. Finally having real cream in my coffee, and not my allergy diet substitute -coconut milk creamer- was sheer delight! As we motored west into Joplin, we passed by the Candy House Gourmet Chocolates. As part of the festival events, they were to be doing tours, so we decided to stop and do that now, as that was something we were interested in. They had loads of various types of candy, mainly chocolates, but also taffy, Jelly Belly, rice krispy treats, lollipops, etc. 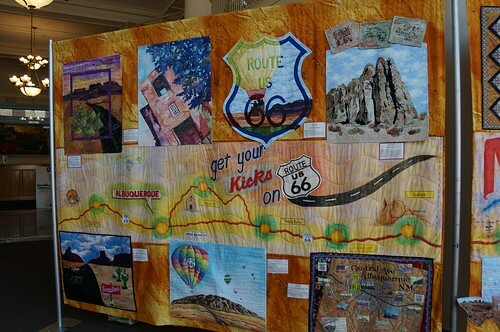 Many of them were also Route 66-themed. 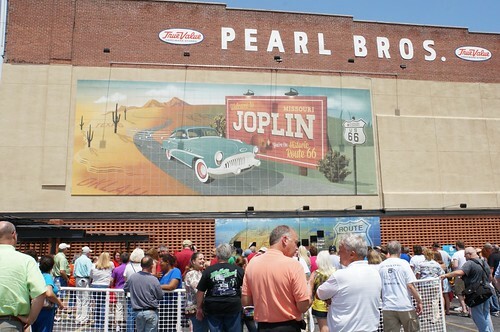 The tour was fun and informative, and if you’re ever in Joplin, it is well worth a stop and a tour! We also bumped into a roadie friend we hadn’t seen in a while, Bob and his wife Kitty. We chatted for a while, picked up some chocolates, and on to our next stop. 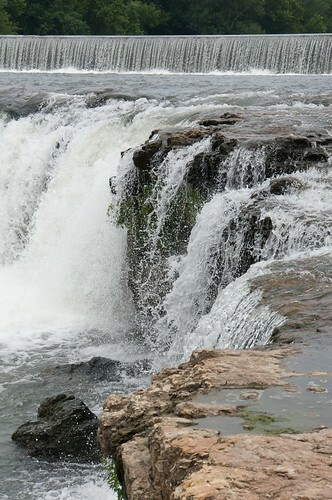 Next up, we were going to check out Grand Falls, the largest, continuously flowing waterfall in Missouri. 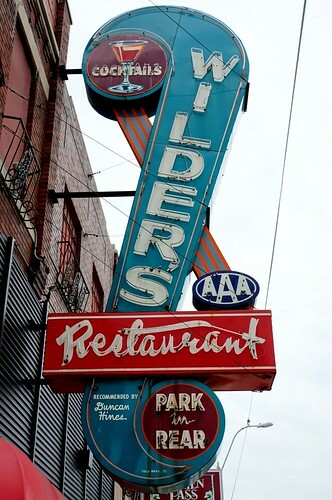 But along the way, we passed by Wilder’s Restaurant and its very cool sign, which is in great shape. Along this route, evidence of the damage and destruction from the 2011 F5 tornado that ravaged Joplin. There were a mixture of concrete foundations where homes once stood, new homes, new homes still being constructed, and in the midst of this were also older homes that were relatively unscathed. 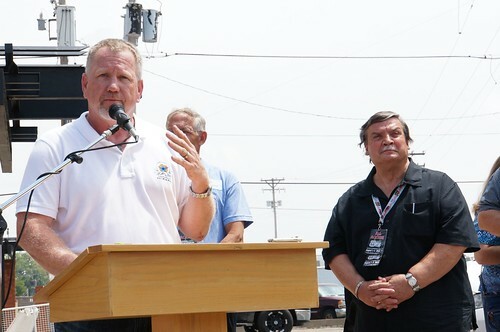 I always liked Joplin, and when I heard about the tornado, I really wanted to try to help out and volunteer some time. 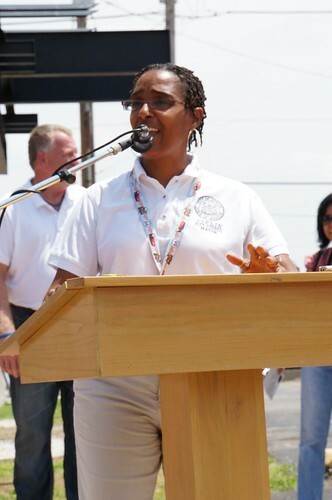 But due to my work schedule and staffing, all we could do is donate financially. 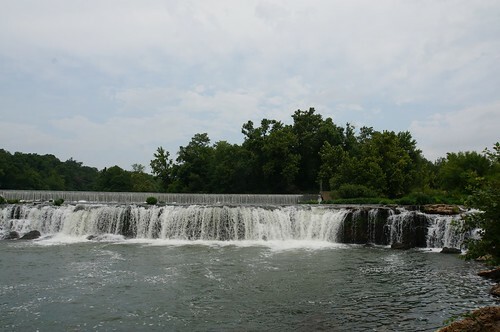 The waterfall was just south of Joplin, and is situated along Shoal Creek. 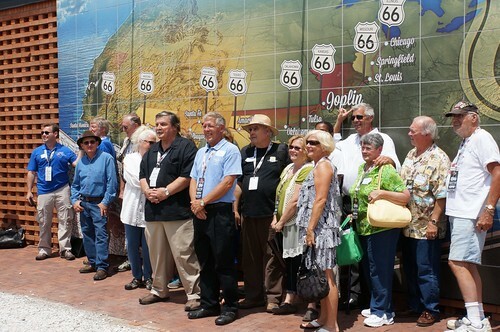 By this time, we thought we still couldn’t make it to Riverton, so we headed back into Joplin for the opening ceremonies and dedication of a Route 66 mural. After the ceremonies ended, we went down to the Christman Center, where the authors and artists were set up. We saw Carolyn there, as well as Mark, Mike and Sharon. We also stopped at a booth for Annie Mouse Books. Our friend Laurel had given us the Route 66 book for our grandson last year, and we decided to get him another book as well. Worth picking up, give them a look! Afterward, we checked out some of the outside booths. There was a mix of various vendors, mostly local. 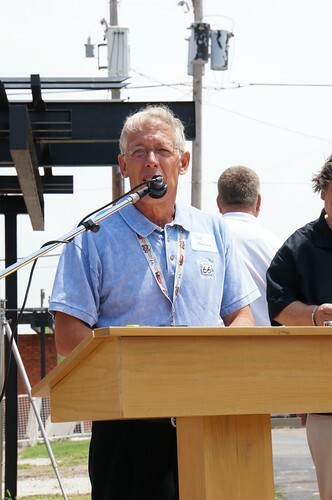 There wasn’t much going on today, as tomorrow would be Joplin’s big festival day. Today, there was alot of activity at Galena’s festival. 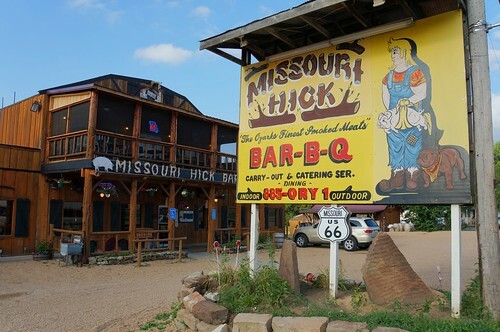 We decided to continue our westward trek to get to the Old Riverton Store, but as we really hadn’t eaten anything today, I thought it would be good to have some lunch too. 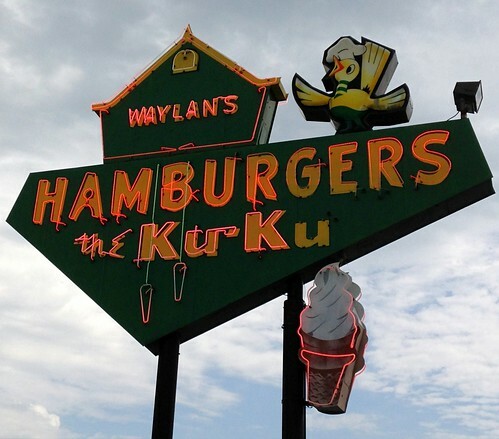 We were so close to Miami that I suggested Waylan’s KuKu Hamburgers….sure didn’t need to twist Pat’s arm. Crushed ice and deep fried pickles? He was completely on board! 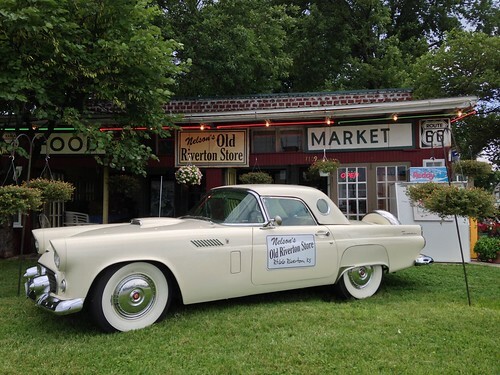 We came back and stopped at Nelson’s Old Riverton Store. Formerly known as Eisler Bros. Old Riverton Store, the store had been managed by their nephew Scott Nelson, who purchased the store in December 2010. 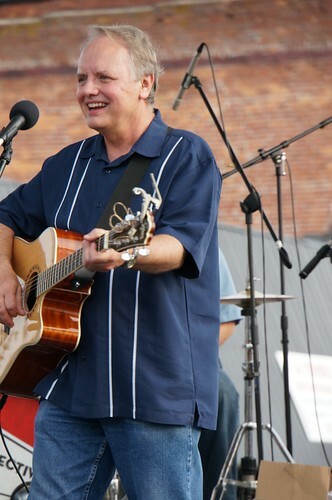 We continued on back to Galena for the festival there and to see The Road Crew – I’d often heard about them, but was not fortunate enough to have seen them; until today, that is. 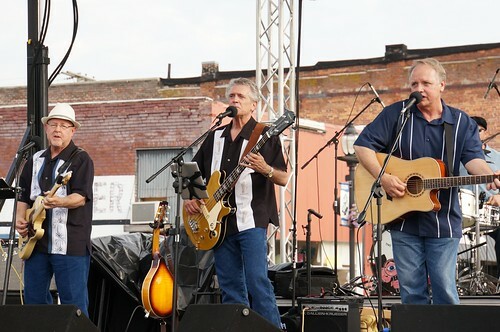 They were performing at the festival in Galena tonight, Joplin tomorrow night, and at Laurel’s Afton Station on Sunday. We had to leave early Saturday to make the haul (literally) back to Indy, so Galena was our only opportunity to see the band. They were great! here’s a quick video I took, followed by a few photos. The rest of my photos can be seen in the slideshow at the bottom of this post. We ran into a number of friends again in Galena, and bumped a few we hadn’t seen yet, including Robert, Fred, Jane, Jim and Shellee. 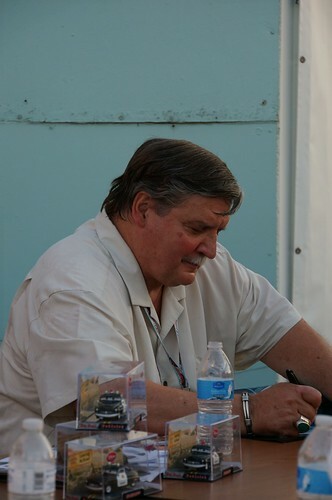 Pat also spotted John Paget, a filmmaker who did one of my favorite Route 66 videos, “Route 66: An American Odyssey.” It was really hot and humid tonight, so we took a brief respite for a cold drink at the Main Street Deli. We listened to The Road Crew for a bit more, then took another lap around Main Street before heading back to the trailer. As much as we want to go to the Route 66 e-group breakfast, we weren’t looking forward to the event ending prematurely for us. Despite having gone to sleep reasonably early, Mother Nature had other plans early this morning, when she decided a thunderstorm was in order. The sound of the rain on the aluminum roof is magnified and immediately woke me between 3:30 and 4:00 am. Despite my body thinking it was an hour later, I was still tired and not wanting to hear the raindrops beating down on the trailer like BBs! My incredibly trusty “Simply Noise” iOS app, which generates various “noise colors” to cover up unwanted noises, didn’t fail me after I stumbled out of bed to grab my headphones and iPhone. Unfortunately, while it sufficiently drowned out the rain, after looking at the radar and seeing a thunderstorm nearby, there wasn’t any way I was going to sleep well until it passed. It isn’t bad enough being in a structure in a place where there is obvious possibilities for severe storms; but being in a tiny aluminum box during a storm did not do my nerves any good and I only drifted in and out of sleep for the next two hours. By 6, I was able to fall asleep, but it was past the time I wanted to get up! The Route 66 e-group breakfast started at 7!! I rushed to get ready, and we made it there by 8. We had a nice time at the breakfast, always a great event organized by Mike and Sharon. We sat with Jane and a couple from Missouri. In addition to everyone we’d seen before, we caught up with more roadie friends, we hadn’t seen yet – Jerry, Emily, Ron, and Laurel, and met some new ones – Joe from the Road Crew stopped over to say hello and thank me for the photos from Galena and we chatted with him and the rest of the band (Jason, Don, and Woody) for a few moments before we left. I even won a print of a brand new painting by Jerry of the Munger Moss Motel! I was hoping to win that, and was I surprised when I actually did! We sadly said our goodbyes and went back to the Candy House to pick up some turtle candy for our T@B/camping friend Elaine. 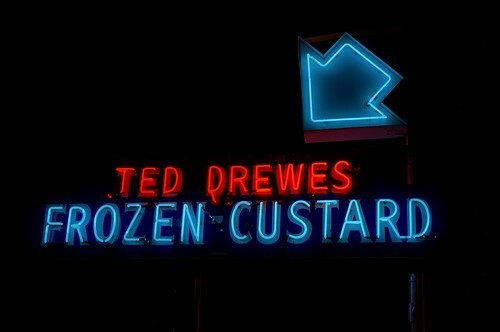 We’d be meeting her and her husband Dane in St. Louis this evening for dinner at The Big Chief (on an alignment of Route 66), and some frozen custard at Ted Drewes. We meandered east alternating on 66 and unfortunately, the Interstate. We stopped by Spencer for a photo op. 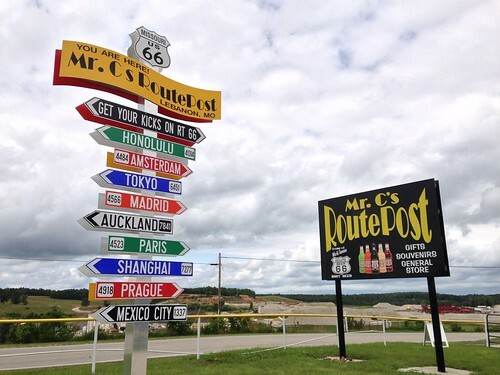 We also stopped by Mr. C’s Route Post, which was closed on the way out, as he was attending the festival. He must have had help today, as his father was tending the store. We purchased some 66 soda and a few souvenirs. 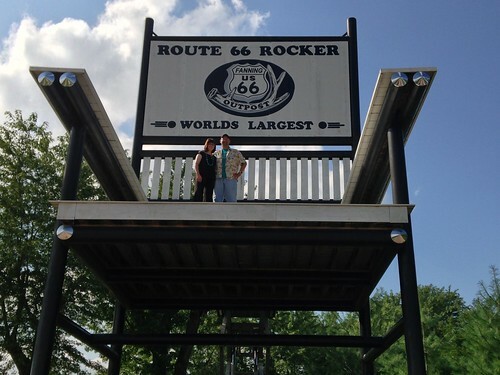 A perfectly timed Tweet from Roadside America reminded us that today was “Picture on the Rocker Day,” the single day per year that visitors are allowed to sit or stand on the giant rocking chair at the Fanning 66 Outpost. Pat was hesitant, indicating that he didn’t really want or need to go up there, but as you can see below, I was able to persuade him otherwise. We also picked up one of the Road Crew’s CDs here, then continued on to Pacific, where we’d be staying at a KOA on Route 66. We settled down and set up the Scotty, and waited for Dane and Elaine to arrive. 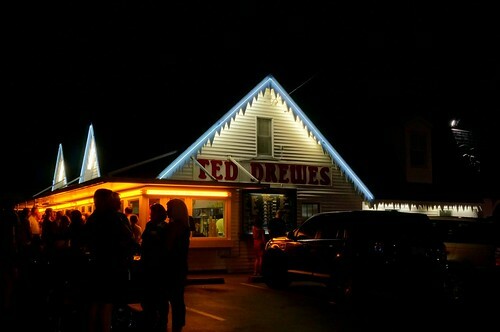 We had a nice dinner at the Big Chief Roadhouse, on an old alignment of Route 66, followed by some frozen custard at Ted Drewes. Our last day was fairly uneventful. We alternated between I-70 and US 40 throughout Illinois and Indiana, finally arriving home at 8:00 PM. Below is a slideshow of all of the photos from this trip. Click any photo to stop the slideshow and view the photos on my Flickr site. 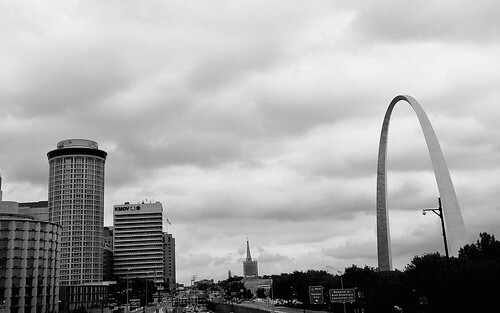 This entry was posted by Jennifer on August 2, 2013 at 11:48 am, and is filed under Road Trips. Follow any responses to this post through RSS 2.0.You can leave a response or trackback from your own site.